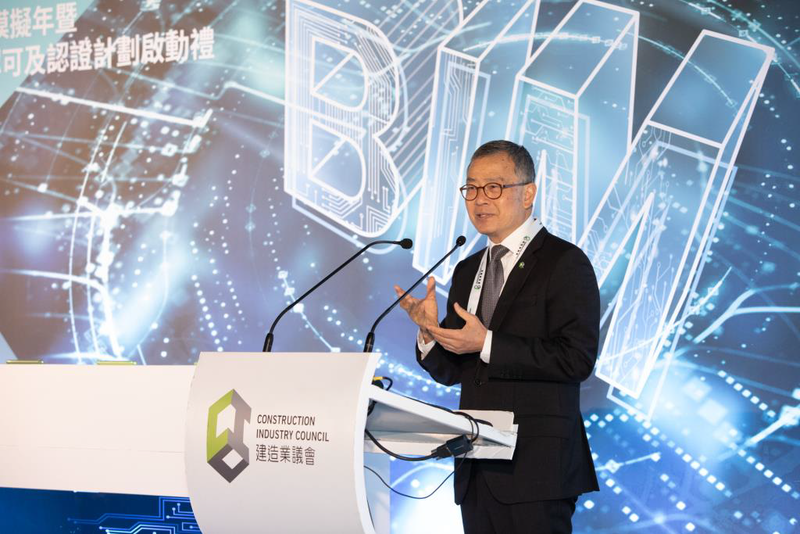 (28 January 2019, Hong Kong) The Construction Industry Council (CIC) today held the BIM Year 2019 & BIM Certification and Accreditation Scheme Launch Ceremony. Ir LAM Sai-hung, Permanent Secretary for Development (Works), Mr. CHAN Ka-kui, Chairman of the CIC, Ir Albert CHENG, Executive Director of the CIC, Ms. Ada FUNG, Chairperson of the Committee on BIM, Ir Prof. CHUNG Kwok-fai, Chairperson of the BIM Certification and Accreditation Board together with Ir John CHAI, Chairperson of BIM Appeal and Disciplinary Board, jointly officiated the launch ceremony with around 150 guests from the industry, marking the opening for the BIM this year. The representatives from Development Bureau of the HKSAR Government, Airport Authority Hong Kong, Hong Kong Housing Authority, Hong Kong Housing Society, The Real Estate Developers Association of Hong Kong, Urban Renewal Authority, West Kowloon Cultural District Authority as well as the CIC signed the BIM Adoption Charter in the ceremony, committed to set up a roadmap for continual and wider adoption of Building Information Modelling (BIM) and related digital technologies in their building and infrastructure projects to enhance safety, build ability, quality, productivity, sustainability and facility management. It signified the pledge to support the use of BIM personnel under CIC’s Certification Scheme. Mr. CHAN Ka-kui, the Chairman of the CIC, summarised the works for promoting BIM development of the CIC in these recent years. 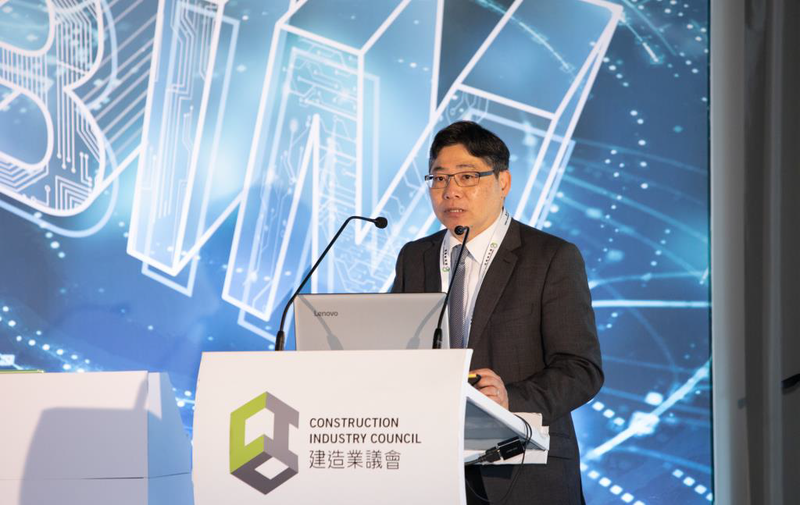 In 2014 and 2015, the CIC launched the “Roadmap for BIM Strategic Implementation in Hong Kong’s Construction Industry” and “BIM Standard (Phase One)”. In 2016, the CIC set up the BIM Innovation and Development Centre, provided various training courses and technologies promotions. In 2017 and 2018, the CIC trained over 2,000 practitioners. 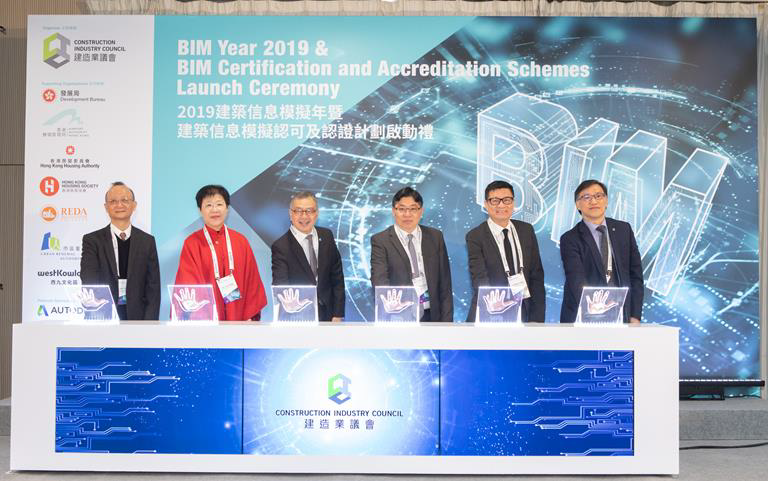 Started from 2017, the CIC has established the Committee of BIM, signed the Memorandum of Understanding (MoU) between the CIC and six higher education institutions in Hong Kong for introducing the knowledge of BIM technologies into tertiary education. The CIC has named 2019 as the “BIM Year”, with a year round activities aiming to draw industry attention and encourage collaboration of industry on the wide adoption of BIM technology. 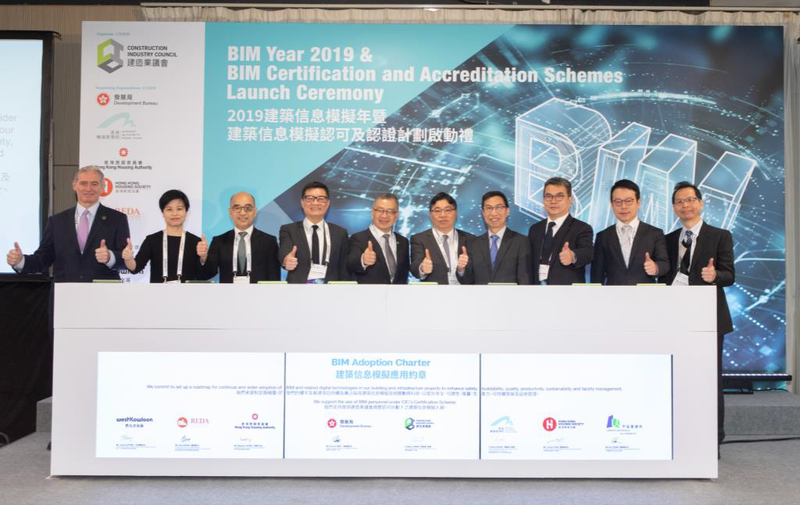 To further uphold the development of BIM in Hong Kong, the CIC introduced the BIM Certification and Accreditation Schemes to ascertain the competency of BIM personnel and the quality of local BIM training courses. More details of BIM can be found at www.bim.cic.hk.